Subscribe to get deals from hundreds of merchants including the best of Triple Three, Mandarin Orchard Singapore! Promotion Period: 02/01/2019 to 30/12/2019. Buffet items may vary.. Not applicable on eve of and on PH.. DBS General Promotion Terms & Conditions apply, visit www.dbs.com.sg/dbscardstnc.. Please always check with the merchant on the validity of the promotion before purchase. Valid from 1 January to 31 December 2017. Maybank TREATS General Terms and Conditions apply (PDF). Please always check with the merchant on the validity of the promotion before purchase. Located on the award-winning Mandarin Orchard Singapore, on 333 Orchard Road, Triple Three Restaurant, named after its location, offers a sumptuous feast of Japanese-themed international buffet spread. As it’s touted as one of Singapore’s most popular hotel buffets with extensive buffet spread, Triple Three Restaurant always aims to live up to its reputation by constantly improving its menu and customer service by serving only the finest dishes that will surely please Singaporean guests who wish to indulge in only the best. Experience a slew of international delights at Triple Three Restaurant’s extensive buffet spread. 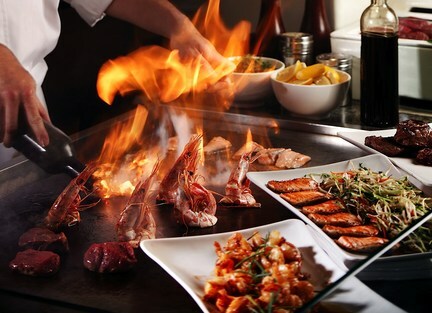 Diners can start by savouring top-notch Japanese cuisines on the Sashimi and Salmon station and the ever-popular live Teppanyaki station. Popular Singaporean dishes such as Hokien Mee and Chilli Crab are also available for consumption. After that, guests can start nibbling on Chinese Dim sums and Indian curries and pratas. Western cuisines are surely not forgotten for guests can head to the Charcuterie Station and Pasta station for delectable French and Italian cuisines. Lastly, guests shouldn’t forget trying the store’s specialty – the perfectly moist, savoury and meaty Honey Baked Ham. And of course, diners can eat their fill of yummy desserts on the restaurant’s extensive spread of international desserts. Aside from that, Triple Three Restaurant keeps things interesting with their themed dinner buffets. On Mondays, diners can indulge on some of the best cuisines from around the world at Triple Three’s International Mondays with free-flow of Kirin draught beer. Made from specially raised duck or goose liver, Triple Three offers a rich and delicate Foie Gras that will surely whet the appetite of any French cuisine enthusiasts on Foie Gras Tuesdays. On Wednesdays, diners can now indulge their palates with the tender and amazingly savoury Wagyu Beef from Kumamoto Region in Japan on Kumamoto Wagyu Wednesdays. Okinawa Thursday’s on the other hand will surely pique the interest of Japanese cuisine aficionados. This premium Japanese buffet selection showcases delightful cuisines from Okinawa prefecture like ashi tebishi, an Okinawa-style stewed pig trotters. On Fridays and Saturdays, Triple Three patrons can delight themselves with Lobster Weekend’s main dish - Lobster Mentaiyaki. For a more affordable dining experience, patrons can take advantage of Triple Three’s regular promos and deals. Diners can enjoy up to 50% discount off their meals for every second adult when payment is made using any DBS/POSB/USB credit cards. A 1-for-1 lunch for adults can also be availed when payment is made using DBS/POSB. Aside from these, Triple Three Restaurant also offers special events’ promotions such as Mother’s Day Lunch that features an extravagant feast for Moms comprising of Lobster Mentaiyaki and an indulgent experience from Mendis Asthetics, available for the first 50 patrons.